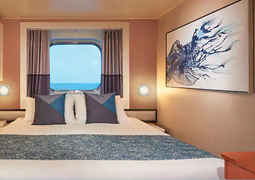 Enjoy a comfortable cruise on the Norwegian Star with beautiful interior and one of the biggest suites at sea, and delicious meals prepared by award-winning chefs . Discover the freshly refurbished Norwegian Star while you cruise to some of the best locations in the world. 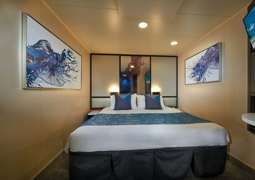 With improved staterooms find your perfect stay in one of the stylish, spacious suites, over 70% of which having amazing ocean views. This Dawn Class ship offers excellent culinary options, along with speciality restaurants to please every palate. Work out in the Barong Fitness Centre or if you’re going at a slower pace, try some wine tasting in the Wine Cellar. With six outdoor hot tubs and an oasis pool there's always the option of a day under the sun. For an adult only getaway, visit Spice H20, where you can sip cold cocktails while you lounge, or later dance the night away under the stars. Never short of world-class entertainment, let the Norwegian Cruise Line production cast blow you away with a show at the Stardust Theatre, a European opera house style auditorium. With options for the whole family to enjoy and romantic elements just for adults, there’s endless opportunities to find your dream cruise onboard the Norwegian Star. 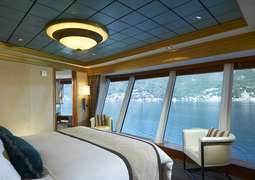 You are certain to find the ideal cabin on board, no matter what sort of break you are looking for. For the traveller looking for luxury and comfort, look no further than a suite on board. You can expect a whirlpool bath, spacious living area and a private butler service while the range of family suites are perfect for larger groups of passengers. A balcony cabin gives you plenty of space to relax, with a seating area inside and a private balcony outside, perfect for enjoying a morning coffee or an evening drink while enjoying the views. 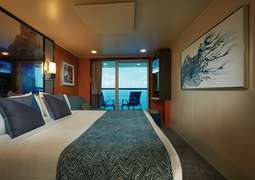 All cabins on board are designed with your comfort in mind and no matter which cabin type you pick you will find little touches that aim to make a cruise on the Norwegian Star as pleasant as possible. Every taste is catered to on board the Norwegian Star, from casual cafes and grills to stylish and contemporary dining rooms all serving up fresh and delicious dishes. 'Versailles', one of the two main dining rooms, is a beautiful place to enjoy finely crafted and carefully selected signature dishes. A range of speciality dining options on board keep everyone on board satisfied, from the Brazilian steakhouse at 'Moderno' to the authentic Japanese Hibachi restaurant 'Teppanyaki Room'. In 'O'Sheehan's' you will find a casual atmosphere where you can enjoy a variety of your favourite comfort foods while trying out a wide range of draft beer. Those with a sweet tooth will find that 'The Bake Shop' the perfect spot to enjoy treats such as cakes, French macaroons and chocolate pralines Enjoy a drink or two at the new Atrium Café & Bar. On board the Norwegian Star you'll find a range of entertainment options which will keep you enjoying every moment on board. Watching a range of shows running are the perfect way to spend your evenings. 'Paradis' is a mysterious and delightful show which is inspired by the best of Parisian Culture and 'What the World Needs Now' is vibrant and elegant musical journey into the career of song-writing legend Burt Bacharach. Enjoy the best of the decade gone by in 'Band on the Run', where you are transported to one of the hottest clubs of the 70's. The bars and lounges to be found on board are ideal to relax and socialise with friends, with the tropical '5 O'clock Somewhere Bar' and the 'Sky High Bar' being highlights on board. To ensure you can keep fit whilst enjoying the food and relaxation, there are many sporting activities available on board. The Barong Fitness Centre offers the latest fitness equipment, with regular fitness and aerobics classes. Relax at Spice H2O - a brand new pool and lounge area. For those who prefer to be in the fresh air, the jogging track circling the ship and basketball and volleyball courts are for exercise outdoors. The golfers amongst you can hone in on the two driving ranges on board. The Mandara Spa will have you feeling refreshed with its wide range of rejuvinating spa treatments and the beauty salon sure to have you looking your best. For families with small children: nappies and wipes for children can be booked as an extra and must not be brought on board. For prices and more information, please contact our service team.